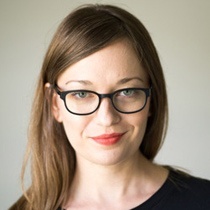 As best-selling author Ann Handley says, “Good writing anticipates what questions readers will have as they read a piece, and (before they ask them) it answers them.” And with new or unfamiliar technologies, people tend to have a lot of questions. One of the biggest challenges for renewable energy companies is that many people are still unfamiliar with new brands and the technologies they're selling. Your website visitors need basic questions answered before they’ll feel comfortable engaging with your company. Create a conversation with your Web content by anticipating the questions people will have when they arrive on your site and explicitly addressing those questions up-front. Let's look at five questions your prospects are likely to ask and how you can use your content to carry on a valuable conversation. For new-energy companies that lack name recognition, straightforward messaging on the home page about who you serve and how you serve them can help build familiarity and trust with site visitors right off the bat. As people conduct research throughout the buyer’s journey, they might come across your company name in search engine results or on social media. If they decide to click through and become a visitor to your site, they’ll want clear confirmation that your company provides the specific product or service they want. Don’t hide this basic information on your product pages or “About Us” page. Make it crystal clear on your home page what your company does and who your target customer is. For example, a homeowner shopping for an energy solution—like solar panels—wants to see that an energy company has experience with residential installations, but a businessperson shopping for that energy solution would want to see that the company has experience with larger-scale projects. As you organize your Web content, use your information architecture and site navigation to speak directly to your buyer personas. 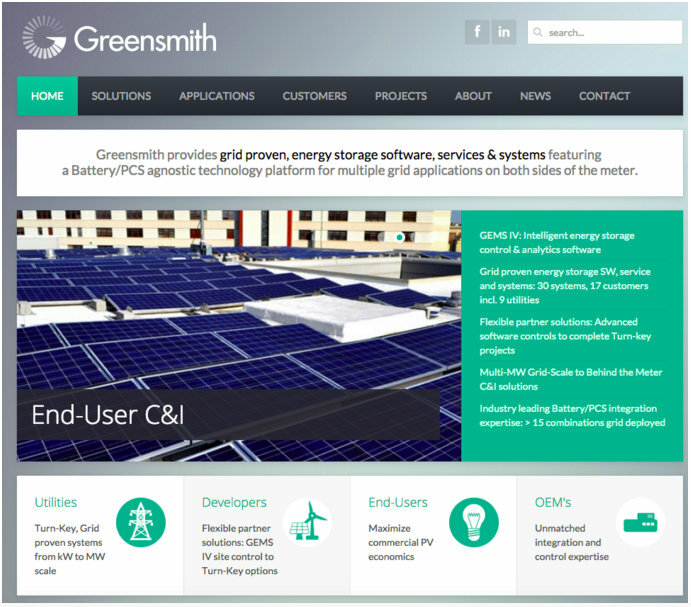 The home page for Greensmith, a company offering turnkey energy storage systems, features a prominent headline stating what the company does, along with four buckets beneath the banner that call out the target customer groups. One of the biggest hurdles to gaining trust is how to educate consumers about the new energy technology you’re selling. Take the fear out of the unknown by telling (and showing) prospects how your technology works. Create content for different levels of expertise, including introductory materials for non-technical visitors. The “curse of knowledge” cognitive bias describes a common challenge for content creators: People who are better informed on a topic have a hard time putting themselves in the shoes of the less-informed. This means subject matter experts tend to write in language they and their peers understand but the same language goes over the head of the average non-expert reader. Keep the curse of knowledge in mind when explaining your technology to the world. Just because you think your content has been simplified into plain language doesn’t mean your audience will find it simple. Run your content by nontechnical readers and check for understanding. And don’t underestimate the value of a simple visual aid to help people make sense of your technology. 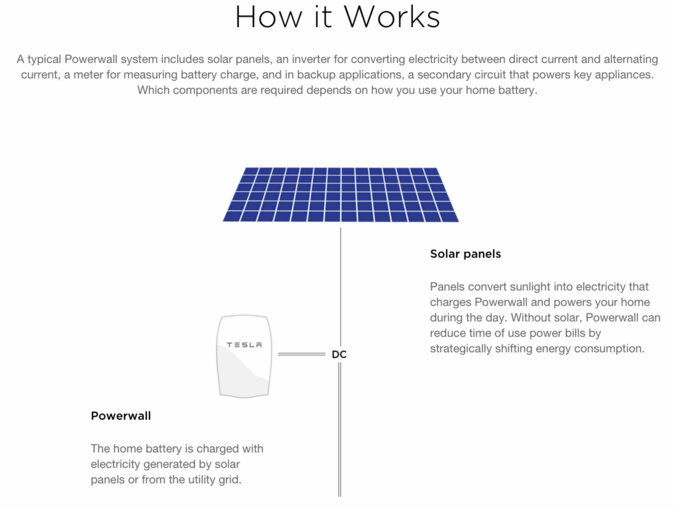 The image below shows how Tesla explains its Powerwall technology, complete with a sleek visual. Imagine visiting an Amazon.com product page and seeing “Contact us for a price estimate” instead of a clearly labeled dollar amount. Would you be befuddled and maybe a bit annoyed? Businesses that sell complex technology systems often take a guarded approach to pricing, which is frustrating for people who are still in the research phase and aren’t ready to get on the phone with your sales department. Be transparent about the costs of your solutions. People will find ballpark pricing one way or another—why force them to get it from someone else’s website? Visitors will appreciate the convenience of having access to cost info on your site, and they’ll trust your brand more for it in the long run. It can be challenging to precisely quote complex system costs when so many components are in play. But at the very least, try to provide ranges or starting price points for your products and services. In “How Much Do Solar Panels Cost?” SunPower readily admits home solar system installation costs are wide-ranging and hard to estimate. But the blog post goes on to offer some average system prices as benchmarks. We’re often wary of technologies that are just coming into the mainstream. To set visitors’ minds at ease, renewable energy websites should highlight any and all evidence of their trustworthiness and reliability. Have you been in business for 10 years? Say so. Have you worked with respected and widely recognized brand names? Flaunt it. Demonstrate your expertise and track record of success through testimonials, awards and social proof. Instead, incorporate testimonials into relevant product and solution pages and consider featuring some of the strongest ones right on your home page. 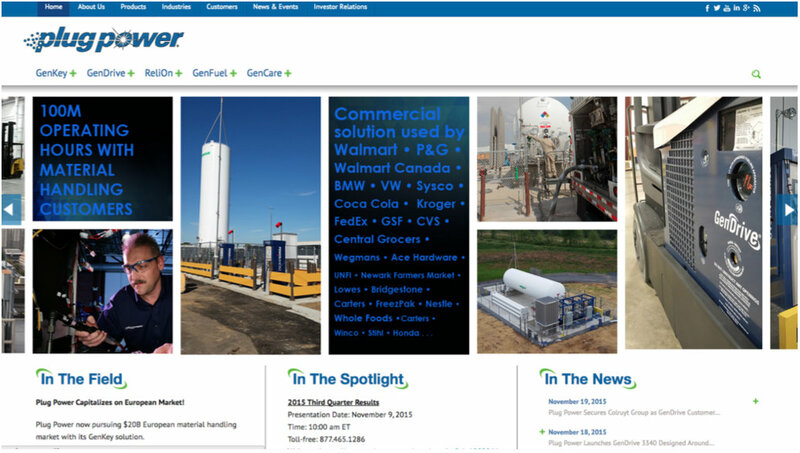 Plug Power, a hydrogen and fuel cell solution provider, calls out evidence of its trustworthiness and reliability on its home page, touting “100M operating hours” and an impressive list of commercial customers. Adopt a friendly and conversational voice that sounds human, not corporate. Don’t be spammy or use a lot of sales language. Let visitors know what sets you apart from industry peers. Tout your technological advantages or experience in the industry, or take advantage of local market leadership to attract prospects in your immediate area. Show the team behind your brand and communicate your values by telling your company story in a compelling way. Showcase your workplace culture through stories about your philanthropic works or community partnerships. Green Charge Networks, an energy storage company, answers all five of these questions to deliver a great user experience on its website. 1. 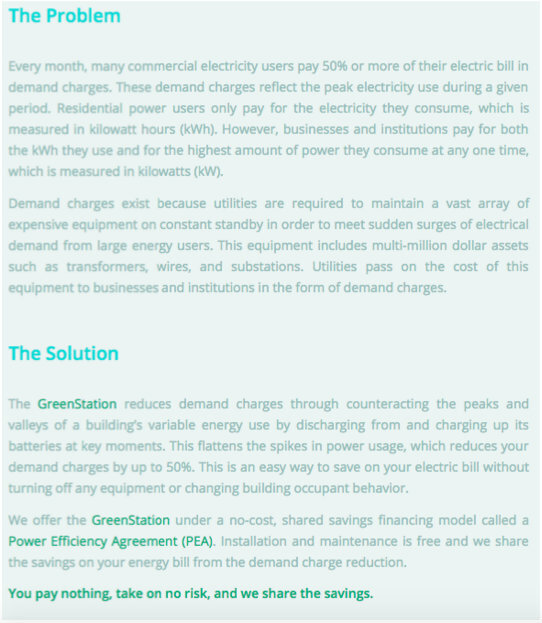 The home page features a concise explanation of what the company does (enables power efficiency through peak-shaving) and for whom (commercial electricity users). 2. Also on the home page, a simple video shows how the service works. 3. 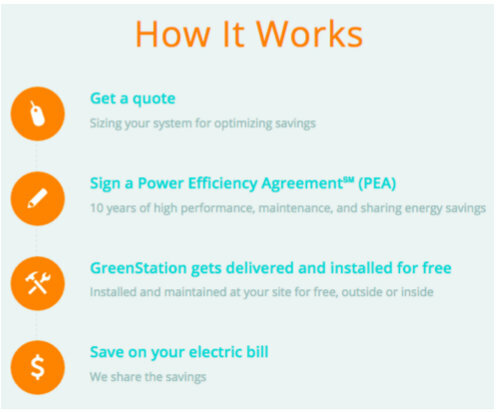 The pricing model is outlined on the home page: Installation and maintenance are free and Greencharge makes money by sharing customers’ energy savings. 4. Again on the home page (notice a pattern here? ), Greencharge encourages visitors’ trust by showing awards the company has won and new partnerships it’s secured. 5. 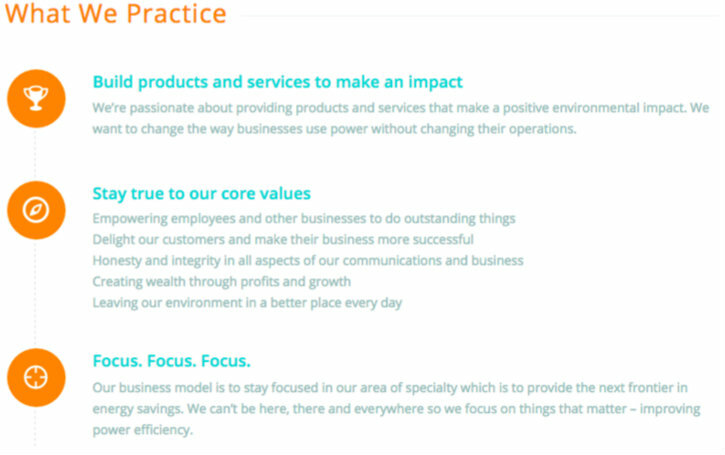 On its “Our Mission” page, the company lays out what it stands for and how its core values are put into practice. Part of providing outstanding customer service is crafting a user-centered Web experience. A streamlined, intuitive site shows prospects you care about their success. When your content is laser-focused on users’ needs and anticipates their every question, they’ll feel valued and ultimately more confident in your alternative energy brand and technology.